The direct gas injection method of pH control is the traditional method of water treatment, where CO2 gas is injected directly into a water stream. Once absorbed, the gas produces carbonic acid that reacts with and neutralizes the alkalis present in the water, thus reducing pH. Efficiency of the CO2 gas depends on factors such as water chemistry, injection design, water depth and physical conditions at the injection point. TOMCO2 Systems’ experienced water technologies engineers take all these factors into account when designing every custom water treatment solution for maximum efficiency. TOMCO2 Systems’ Direct CO2 Gas Injection System can be engineered as either manual, automatic or CO2 flow-paced pH control. The system is built around the legendary TOMCO2Systems storage units and vaporizers for maximum system quality. 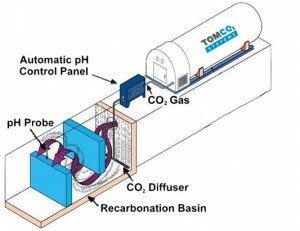 Just like our patented Pressurized Solution Feed System, TOMCO2 Systems’ Direct CO2 Gas Injection System has an excellent track record for solving potable water and wastewater problems.